Our luxury three floor apartment is located in a brand new development in the original Méribel village. 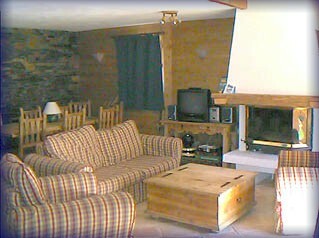 It is conveniently near the Telesiege de Golf - a chairlift that takes you into all of the vast Three Valleys ski area. The Apartment is 120 sq metres in all - including two balconies. It consists of a very large living area with a log fire creating that traditional Alpine atmosphere, satellite TV and a video player. The apartment is ideal for two or even three couples with lots of kids who love to share with their pals! There is also a sofa bed for two in the living area which you might want to use depending on the mix of your party. There is an underground car parking space. There is a fully-appointed kitchen. 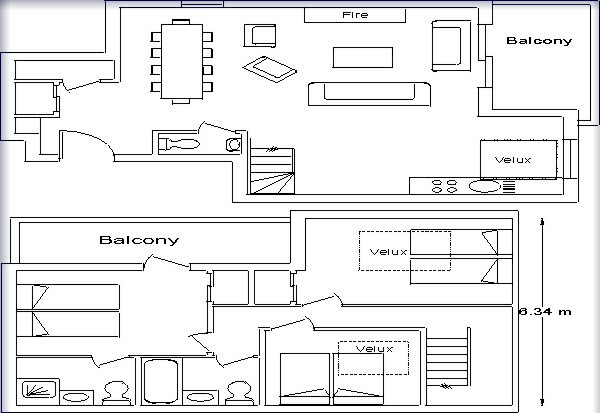 On the first floor there are three double bedrooms - one with an en suite bathroom. In all, the apartment has two bathrooms and a third toilet. A feature is the large attic bedroom (20 sq metres) which sleeps four.